Priyanka Chopra was in Switzerland with hubby Nick Jonas and his family over the holidays. Priyanka Chopra has always been vocal about her being ‘high maintenance’ and that she worked hard to be able to live the life she desires. The desi girl has always impressed us with her fashion game and we’re not one to judge her for making the choices she does, coz she has the money yo. Recently, Priyanka was holidaying with beau Nick Jonas and his family in Switzerland from where she shared their skiing pictures. Now, all was well till we didn’t know the price of her skiing outfit! 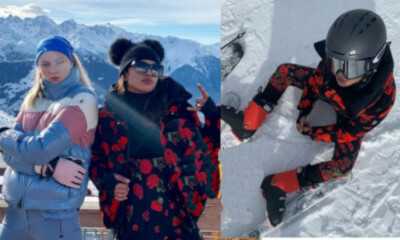 Priyanka Chopra’s ski outfit cost an exorbitant $1,140. Wait till you read the whole thing. The ski suit cost $1,140 while the matching jacket costs $2,045. So Priyanka’s black rose printed ski suit costs a whopping $3185, which is Rs.2,22950 lakh INR. The Quantico star shared pictures of her and Sophie Turner in their ski suits and they look adorable. Sophie’s pastel pink and white suit also cost a whopping $1,350 while the matching pants cost $990 and $975 for the helmet.